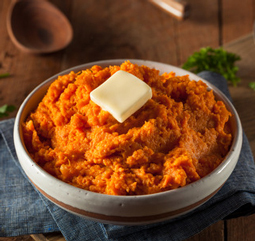 Spicy Mashed Sweet Potatoes - A recipe from Savor California, the online showcase for extraordinary gourmet foods and beverages from California. Cook sweet potatoes in boiling water or cut up and steam, until fork tender. In a large bowl, with mixer at low speed, beat sweet potatoes and butter until smooth, scraping bowl constantly with rubber spatula. Add brown sugar, Caged Heat, salt and pepper. Increase mixer speed to medium. Beat 2 minutes longer or until potatoes are light and fluffy.